“I will show you what you need to know to become a musician who is able to think for yourself and learn how to improve fast ”. You can start by heading over and signing up for the newsletter to get the latest free lessons and tips straight to your inbox. 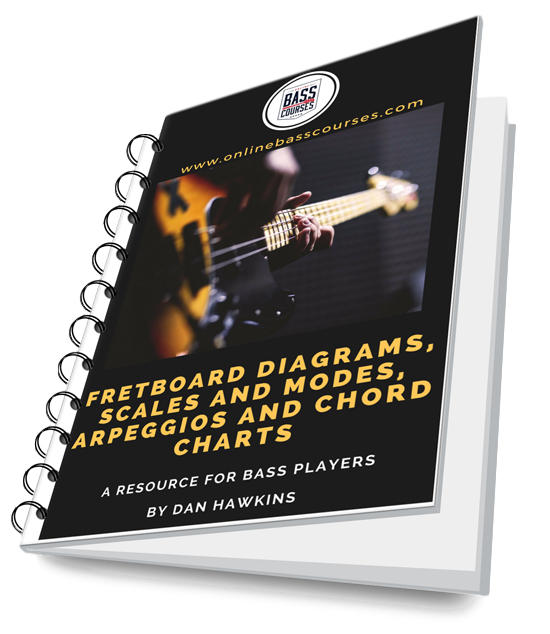 You will also receive a free 23-page ebook containing fretboard and chord diagrams, scales, modes and arpeggios you can use in all kinds of creative situations. Get in touch below to discuss setting up a lesson. We can organise a free session to test the internet connection and talk about what you might want to learn. Groove - timing, feel, using the metronome, beat placement, meter. Fretboard Knowledge - using patterns on the bass, learning all the notes, connecting your ear to patterns. Technique - fingerstyle, slap, plectrum, tapping, hammer ons, pull offs, bends, slides, vibrato, muting, ghost notes, position shifts, how to work on speed and accuracy. Tunes - rock, jazz, pop, blues, funk, RnB, hip hop, learn your favourite song. Reading - basic reading to advanced sight reading, chord charts, Nashville number system, why reading is a great skill. Gear tips - what gear you need and how to use it. Learn incredibly useful scale, mode, chord, harmonics and arpeggio shapes.